Hope's Cafe: Olasonic USB-Powered Computer Speakers Giveaway!! 2 Win! Olasonic USB-Powered Computer Speakers Giveaway!! 2 Win! Hey, yesterday I posted a review of some awesome new speakers for my computer from Olasonic-the TW-S7 speaker system. 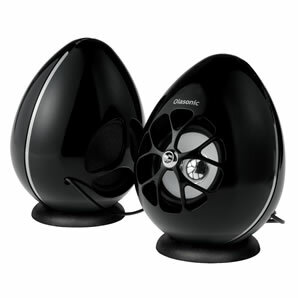 These are the most amazing computer speakers I've ever used, and sound like I have surround sound on my laptop! 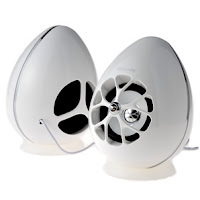 I have some really good news to share too, because Olasonic is giving 2 of my readers their own TW-S7 Speaker System!! The first winner will get to choose their color (Magnificent White or Noble Black) and 2nd winner gets whichever color is left. These speakers are powered solely by your USB port, so it's easy to use too. 2 of my winners will receive a TW-S7 Speaker System!! I learn they install automatically without the need of additional software. I learned: The TW-S7 employs direct transfer of digital audio signals over the USB interface to minimize added noise and distortion in order to reveal the full potential for a personal computer to deliver high-fidelity sound reproduction. They have a pretty comprehensive FAQ, but All I really learned about the company is that they are in CA and Japan. I learned they are located in City of Industry, California which is actually a few miles from where I used to live. Look like great speakers. Cool looking too. I read your review and it was very helpful to see the difference in audio; you said it was like having surround sound speakers on your computer. That it literally sounds like you have surround-sound on your computer now! I like that it requires no electrical outlet. Thanks for this giveaway! The USB cable is connected to the right speaker. I learned you don't hvae to plug them into a wall outlet, just in the usb port. You choose the black speakers because they don't show dirt and don't wear as quickly. Entered the WalletBe Ladies Wallets Review and Giveaway! Entered the Emani Mineral Cosmetics Review and Giveaway!! Entered the Branson Blast #5-Cold Stone Creamery Review and Giveaway!! Commented on Branson Blast #9-Tour The Table Rock Dam and Powerhouse! TERRIFIC, I learned that the TW-S7 installs automatically without the need for special drivers or software. I your review you concluded that with the TW-S7 'It literally sounds like I have surround-sound on my computer now!' which sounds like a strong recommendation. I learned the speakers are designed for use exclusively with Macintosh personal computers running Mac OS9.1, OSX10.1or later and PCs running Windows 2000, XP, Vista or Windows 7. In your review, you mentioned that "it literally sounds like I have surround-sound on my computer now"
Learned from your review They are super-simple to get hooked up, and at least for my computer, the sound gets switched over to the speakers right away; I don't have to adjust any controls.